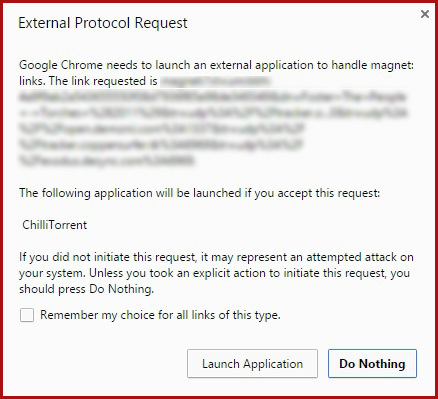 There are occasions when opening a magnet link in Google Chrome web browser pops up a box of External Protocol Request asking if you want to launch the application (ChilliTorrent). Clicking “Launch Application” does often nothing. It is some sort of a Chrome side issue, as magnet links work with ChilliTorrent perfectly in other web browsers. Also there have been same issue with other Bittorrent clients. There are two ways how to bypass this issue. 1. You can make a right click with your mouse on the magnet link and select “Copy link address”. Then open up ChilliTorrent, click the + icon (File -> Add Torrent), make a right mouse click to the box and select “Paste”. Now you have pasted the magnet link to ChilliTorrent, and click on “Open” to start downloading. 2. Open the website of magnet link in any other browser like Mozilla Firefox or Internet Explorer, and try again.